Q1. How to use lsblk command? Q2. How to make lsblk display empty devices as well? Q3. How to make lsblk print size info in bytes? Q4. How to make lsblk print zone model for each device? Q5. How to make lsblk skip entries for slaves? Q6. How to make lsblk use ascii characters for tree formatting? Q7. How to make lsblk display info about device owner, group, and mode? Q8. How to make lsblk output select columns? In Linux, block devices are special files that refer to or represent a device (which could be anything from a hard drive to a USB drive). So naturally, there are command line tools that help you with your block devices-related work. Once such utility is lsblk. In this tutorial, we will discuss this command using some easy to understand examples. But before we do that, it's worth mentioning that all examples mentioned here have been tested on an Ubuntu 18.04 LTS machine. gather  information. If  the udev db is not available or lsblk is com? where a stable output is required. Following are some Q&A-styled examples that should give you a better idea on how lsblk works. Basic usage is fairly simple - just execute 'lsblk' sans any option. The first column lists device names, followed by corresponding major and minor device numbers, whether or not the device is removable (1 in case it is), size of the device, whether or not the device is read only, type of device (disk, partition, etc), and finally the device's mount point (if available). 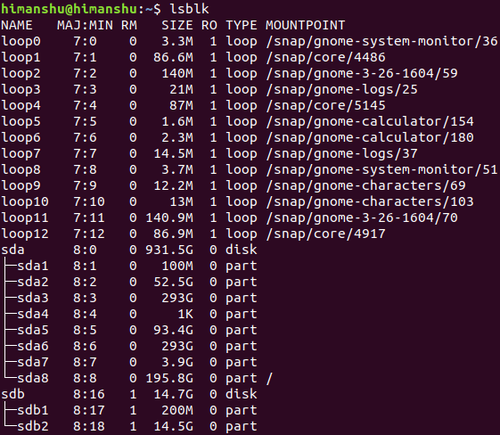 By default, the lsblk command only displays non-empty devices. However, you can force the tool to display empty devices as well. For this, use the -a command line option. The 'loop 13' row is the new addition in this case. By default, lsblk prints size information in human readable form. 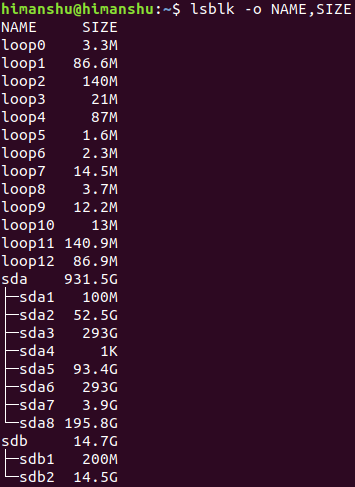 While this good, there are times when you may need size in bytes. What's good is that there's an option (-b) that does this. So you can see the 'Size' column now contains entries in bytes. This you can do using the -z command line option. For this, you need to use the -d command line option, which tells lsblk to not print information related to holder devices or slaves. If you compare with output produced in previous cases, you can see no slave entries are produced in output in this case. By default, the type of tree formatting lsblk uses may not be user friendly in many cases. For example, copy-pasting it may cause formatting issues. So if you want, you can force the tool to use ascii characters for tree formatting, something which you can do using the -i command line option. 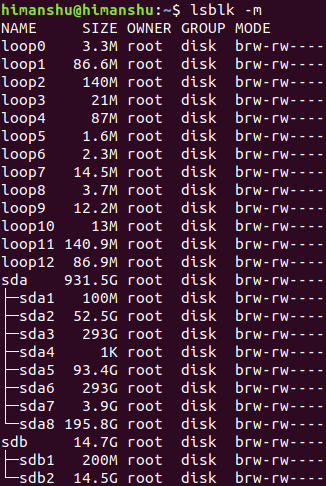 So you can see the output (see sda entries) now contains ASCII characters in tree formatting. 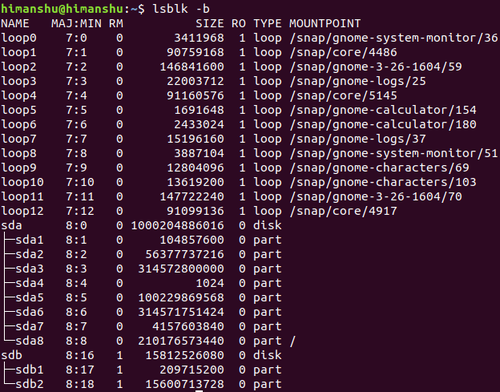 This can be achieved using the -m command line option. If you want, you can also direct lsblk to output only select columns, something which you can do using the -o command line option (which requires you to pass a comma separated list of columns that you want to display). 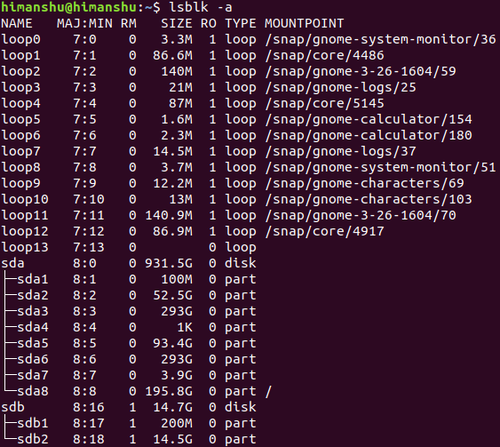 If your Linux work involves accessing information related to block devices, then lsblk is a must know command for you. Here, in this tutorial, we have discussed several command line option this tool offers. To know more about lsblk, head to its man page.